This is the ultimate guide to getting and using gold bars in Big Fish Casino. Gold bars are one of three types of currency that Big Fish Casino has; the other two are chips and tickets. You can collect Big Fish Casino’s gold bars either for free or by buying them and then use them to buy fun gifts for other players or trade them for chips for yourself or others. There are a few ways to get gold bars in Big Fish Casino. The fastest and easiest way is by purchasing, but you can also get free gold bars for free. 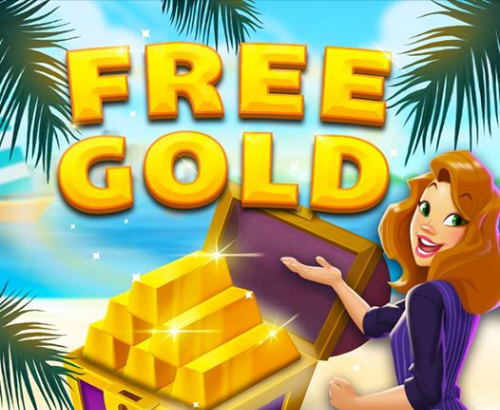 The two ways to get gold bars for free are through freebie links and through playing specific slot machines. Big Fish Casino occasionally offers promotional links through social media and email that will award free gold bars when you click them to visit Big Fish Casino. ChipHungry has a constantly-updated list of Big Fish Casino’s freebies. Most of the offers are for free chips these days, however sometimes they give 10 or 12 free gold bars to players this way. Some slot machines at Big Fish Casino reward players with gold bars in their scatter bonus rounds. The slot machines that give gold bars are: Aztec Gold: The Lost City, Dogtown 2: Paw and Order, Myths of Persia, Sugar Dash, Treasures in Time, Helsing’s Midnight Hunt, and Big Fortune Valley. You can also see these in the sortable, full list of Big Fish Casino’s slots — clicking on the Gold table header will show you which slots reward gold and which do not. When you get three or more scatter symbols on the paylines, you will enter the bonus round where you can spin for one of three prizes: gold, free spins, or chips. The amount of these you win is dependent upon how much you are betting and how many scatters you received. Collect criminals (dogs and cat) on the reels to complete requirements at the top of the game. Both Pugsy (pug) and Bruno Corlebone the Dogfather (bulldog) pay out gold bars when you complete their requirements. The amount you receive is based on how much you are betting throughout the entire time you collect the symbols. Collecting the featured symbols will reward you with bonuses of chips, free spins, or gold bars. Collecting 80 ships will reward you with gold bars. The number you receive is based on how much you are betting throughout the entire time you collect the symbols. To maximize your earnings without chipping away at your stash of chips too much, you should bet a minimum amount while collecting the books and lamps, but bet more during the ship round to earn more gold bars. When you get three or more Sugar Dash symbols anywhere on the reels, the board game bonus round begins. Spin the wheel and you’ll randomly be awarded either chips, free spins, or gold bars. The amount you earn is based on how many Sugar Dash symbols you got and much you bet during the spin that landed you in the bonus round. Collect the featured symbols to complete the required amount at the top of the screen. There are 3 symbols that you can be required to earn: cube, orb, and pyramid. Only pyramid rewards gold bars for completion; the other two reward chips. Gold is a reward in the scatter (3x or more bonus symbol) feature in Helsing’s Midnight Hunt only when you are betting max. When you bet 1M in regular or over 6.25M in VIP Big Fortune Valley, the Ultra coins have a chance to have a gold bar reward as well as chips. To spawn Ultra Coins, get 6 or more coins on the reels in one spin. It’s rare, but can be very lucrative! Another way to get gold bars in Big Fish Casino is to purchase them. Click on the green “Get Chips” button in the upper right-hand corner of the lobby to enter the store. Scroll down past the chips packages to see the packages of gold for sale. Each package will also include VIP points to help you reach the next tier and tickets, which you can redeem at the Reward Center, which can be found on the far left side of the lobby. If you’ve never purchased chips or gold before, a purchase of $5 or more will automatically give you VIP Tier 4 benefits before reaching VIP Tier 4. These benefits include early access to new slots and access to all of the VIP Slots. Now that you’ve got Big Fish Casino gold bars: what are they for? A lot of players wonder what are the gold bars for in Big Fish Casino. Gold bars are used for giving either chips or fun gifts to yourself or other players. As you can see, one gold bar is worth 2,500 chips no matter which gift package you exchange your gold for. The 2.5k chips and 10k chips packages come with a gift icon for the recipient’s profile. To give chips to another player, click on their profile picture to view their profile. Click on the “Send Gift” button. Once you’re in the Gift Store, click on the Chips tab at the top then click on the “Buy One” button next to the chips gift you’d like to send. To give chips to yourself, click on your profile picture to view your profile and then click on the “Send a Gift” button. Once you’re in the Gift Store, click on the Chips tab at the top then click on the “Buy One” button next to the chips gift you’d like to give yourself. You can give fun gifts to yourself and other players in the room you’re in by click on someone’s profile picture to view their profile. Click on the “Send Gift” button to visit the Gift Store. Choose any of the featured gifts or treats to send. You can Buy Round, which will send the corresponding gift to everyone in the room you are in including yourself, or Buy One which will just send it to that one person.